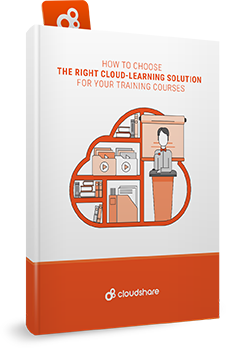 In the enterprise software business, the effectiveness of your cloud based training is all-important to your bottom line. 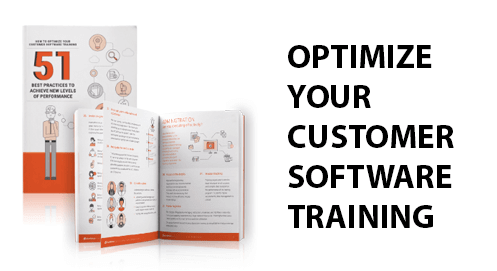 Our new eBook, How to Optimize Your Customer Software Training: 51 Best Practices to Achieve New Levels of Performance, presents a detailed review of the many areas you need to master to maximize product adoption and customer suc­cess. Strategy – Is your customer software training strategically aligned with the specific objectives of your company? The eBook highlights six savvy starting points aimed at reducing customer support costs, reducing churn, getting customer feedback, generating revenues from training and developing customer advocates. Diagnostics – Training leaders must hone in on existing problems to increase the efficacy and efficiency of customer software training programs. The eBook presents six strategies to help you perform meaningful diagnostics. Content development – The content used in your cloud based training must be useful across the spectrum of learning styles. While developing content is a creative exercise, it also relies on a number of critical processes. Nine best practices are featured in the eBook to help you create more engaging training programs. Content delivery – Are your students learning the material? In one of the most important sections of the eBook, we look at eight ways to optimize how the training is conveyed, distributed, and accessed. Administration – Training managers have been known to say that administration is the lifeblood of an effective training operation. Our eBook offers five ways to optimize software training programs with end-to-end administrative processes. Measurement and reporting – Software training organizations must measure results, and ultimately, the ROI of their customer training spend. The eBook takes a close look at six elements of a measurement and reporting strategy that systematically positions your company to make process improvements. The eBook, How to Optimize Your Customer Software Training, presents research from Evaluating Training Programs, in which authors Donald L. Kirkpatrick and James D. Kirkpatrick introduce a four-level training evaluation model, designed to help you objectively analyze the effectiveness of training. Portfolio management – The ability to manage large portfolios of learning content is a key to reducing costs and ensuring proper program positioning. The four portfolio management strategies in the eBook reveal how to manage customer training programs to ensure a diverse mix of courses and training modalities. Applying technology – Technology used in software training must enhance the way students learn. Unfortunately, training technology is often cumbersome or difficult to access and navigate. Six important strategies offer useful insights to help you make the most of your training technology. Virtual training – Do you plan to scale your customer software training programs? While many leading training organizations are adopting cloud based training, authoring platforms, and collaboration tools, some of the most progressive companies are also moving their IT lab delivery systems to the cloud. A virtualized IT lab ecosystem gives you the ability to deliver hands-on IT training to students anywhere while eliminating infrastructure and setup costs. As a leader in the industry, CloudShare offers many features to meet the needs of growth-minded training organizations. A concise overview of the features and benefits of the CloudShare platform is presented in the eBook’s final pages.